Posted on Sunday, October 14th, 2007 at 5:43 am. You’ve probably seen this beautiful woman on TV at some point, but didn’t know it was her. She is Andrea Lin, a model, dancer, artist, and now producer who recently moved from Taiwan in 2001. After establishing her stateside career in New York City, she now currently resides in LA. I recently sat down with Andrea in a small little cafe in the heart of LA’s Chinatown to delve into her world, to uncover the reality of her alter ego “Superdoll,” and to find out what has propelled her blossoming career. H: Hi Andrea! I know you’re a busy person, so thanks for joining me today to give the audience of TaiwaneseAmerican.org an opportunity to learn a little bit about who you are! H: I’m impressed! You are a model, dancer, actress, producer, choreographer… You’ve been on P. Diddy, Madonna, Avril Lavigne, Britney Spears, Jamie Foxx music videos. You’ve been on Spike TV commercials, the Dave Chappelle show, and more. Your modeling and print work is too extensive to list. This three page resume reads as if you are three people in one, but the underlying theme seems to be a certain artistry. When people ask who you are, what do you tell them? A: I tell them I’m an artist that does many things. I love art. I started drawing when I was a little girl. I’ve always believed that performance and visual arts should work together because the goal is to provoke a certain feeling. I think of it all as a creative painting, and each and every detail should be the best that it can be. It should touch people. That’s my goal. H: I saw some of your drawings and artwork on your Flickr album. Do you do that just for fun? A: Yes, I wanted to be a manga comic book artist when I was young. To me, manga represents life, conflict, drama, creativity, dreams, and how to get through it all. It was hard though, because during the time I was growing up, the usual saying in Taiwan was “you must study hard or you should work in the factories.” I knew what I wanted to do, but I felt I that I only could do it as a hobby, not as a profession. I knew what I felt most passionate about and what moved my heart, but I felt that my environment was denying my dreams in every way. So I learned to deny myself and embrace what I was expected to. After travelling to America on my own, I realized my opportunities to break out of a destiny that I was told to accept. So I did. I gave up a high-profile degree, family and my homeland. I said to myself, “I’d rather be a poor artist instead of a wealthy robot.” I was ready to stand by my choices. If I failed, then at least I tried, and I would know I was not a coward. H: So that is was ultimately brought you back here from Taiwan? A: In 1999, I had gotten into one of the top colleges in Taiwan. You know, it’s a high pressure school system there, but after I started my first year in one of the toughest colleges, I just discovered that I wasn’t interested in that path. I also had been pursuing modeling and ballet, so I took a year off and soon went back to America. Our discussion proceeded into the topic of passion and motivation. As Andrea recounted various stories from a manga ballerina character that inspired her to follow her dreams to an epic story of a defeated king who reclaimed his power through suffering and submission, I couldn’t help but wonder about the challenges she had faced in her own life. The bottom line, as she says, is about “truism vs. individualism,” and it is these ideals that influenced her way of thinking. It was clear to me that Andrea is a person who has thought deeply about life goals and jumping beyond boundaries. She is driven to succeed. Andrea’s cell phone rang, and I insisted she take the call. Although, I tried not to listen in, I couldn’t help but tune into a heated discussion regarding financial issues, contracts, and conflicts with one of the hired dancers in her latest project. Clearly, in the fantasy world of art, dance, and modeling, to succeed in this business, one must be a strong and savvy businessperson as well. A: It’s rough to be female. Rougher to be a pretty foreign female in this business. I believe in putting in 100% effort. It really takes courage. But more than that, it takes endurance. You can’t hold back. You have to always move forward. Conquer it. H: I love how your website is set up. 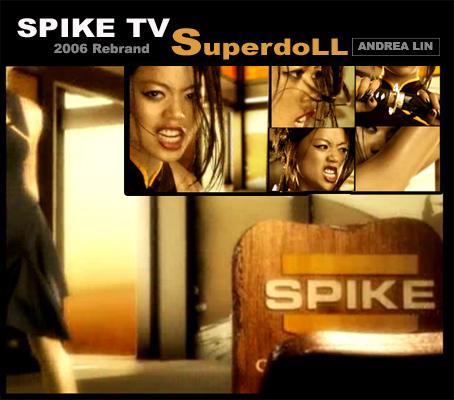 You have “Who is Andrea Lin” on one side, and “Who is Superdoll” on the other. So, tell me more about “Superdoll” and this dual persona? Who is she? What is it all about? A: The basis is life. Superdoll is fantasy. It is my emotional projection of ideal, but I can’t live it day by day. It is an emotional outlet as a performer who exists in the space she belongs in, doing what she wants to do. Yet I can be me, and still be accepted by society. H: What projects are you working now? And where do you hope to be in the next few years? A: Right now, I’m currently producing my own dance instructional DVD. It’s my choreography, my concept, my creative direction. Doing something like this is a dream! It isn’t easy, but it’s worth it. Hopefully next year, I can continue launching a Superdoll campaign… The subject matter, for now, is a secret! My dance DVD will be here very soon (http://danceagogo.com). It’s dedicated to women, femininity and movement. It’s hot, you’ll see! H: I’m sure it will be! Oh, one last question… What’s your favorite Taiwanese food? H: It’s so funny you said that! I just happen to have a little appreciation gift for you. It’s a TaiwaneseAmerican.org sponsored “Stinky Tofu” T-shirt design! A: Oh, it’s so cute! I like it! H: Thanks again for your time Andrea! And good luck on all your future endeavors! We’ll be keeping an eye on you and your future projects! Producer/Director Del Weston. Editor Josh Neufeld. Music Ben Chan. Photography/Graphics: Andrea Lin.